Just a girl to those around her, Elizabeth is now the Queen of England. She has outsmarted her enemies and risen above a lifetime of hurt and betrayal, a mother executed by her father, a beloved brother who died too young and an enemy sister whose death made her queen. She leads her country, torn between who she is and how her advisers expect her to become. A woman of the people, a wife, a mother. But Elizabeth is pure of heart and her childhood friend her only love, behind that of her country. But behind the grand women is a group of men who are trying to shape their Grace to do their bidding, comparing her to that of her cousin, the now infamous Queen of Scotland who is also next in line to the throne. In a family surrounded by blood and scandal, Elizabeth must rise above the whispers and dominant men who expect her to rule with an iron fist and become the woman she needs to be. For herself. Wise, honest and a female leader within a man's world. 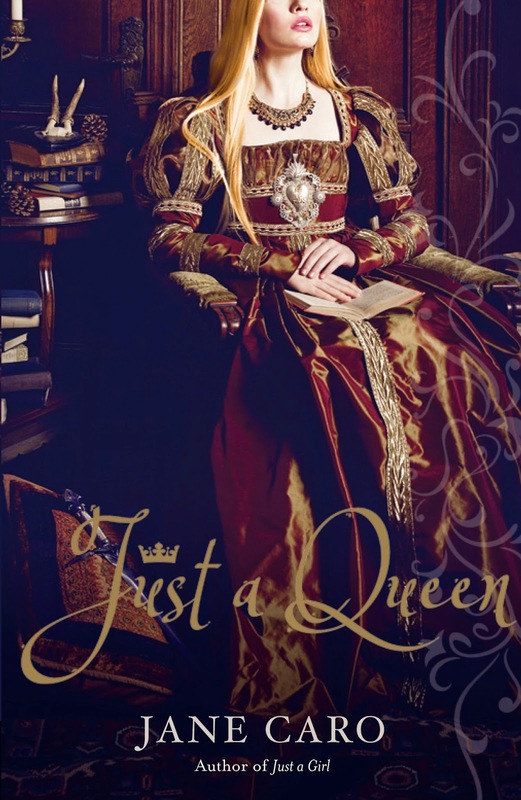 Just a Queen was a surprising and enjoyable read that is a cross between young adult and historical adult fiction. Told from Elizabeth's point of view, we seen a Queen who is nearing middle aged and looking back over her upon the throne, now older but perhaps none the wiser. The fictional insight took quite a few chapters to immerse myself in, but as the reader begins seeing the girl behind the Queen, I felt more endeared to woman that was ultimately indecisive and seemingly unhappy. Thrust into a position of power well beyond her control, she's known as the Virgin Queen, pure and untouched. But she harbors a deep and passionate love for her Horsemaster, a man she cannot marry for fear of reprisal. Many a suitor makes their attentions known from across the seas, Princes and King's alike. But not only does Elizabeth refuse to take a husband, but also to name an heir to her throne should she be ostracised or killed. Where Elizabeth is seen as a darling of purity, her cousin Mary is not. The now Queen of Scotland has seen multiple marriages and scandal, but her strong religious ties still ensure the defamed Queen may still hold a place on the throne occupied by Elizabeth. The men in her life were deplorable, where Elizabeth wanted little more than to find a friend within the Queen of Scots, the secrets and whispering gossip had forced her hand. But as the storyline drifted back and forth between Elizabeth sharing her younger years as a newly anointed Queen and her older self looking back with much regret, the fictional version of Elizabeth seemed more so the spoilt child who never quite grew beyond her reign and allowed herself to be swayed far too easily. But without a doubt, the historical prose was lovely. I could easily envision what it felt to be a woman in a predominantly male world. Her subtle acts of defiance during that period may have paved the way for equality today, but sadly those were too and far between. It was rich, detailed and a wonderful insight into a formidable woman through her fictional life. I'm generally not a fan of historical too, but what little I knew about Queen Elizabeth, I wanted to give this one a go, seeing the woman had en era named in her honour. The gossip and scandal that surrounded her could have been lifted from a soap opera script, I loved reading it. The cover is absolutely lovely Paula, it has little gold accents and font on there. I'm not usually either, but Jane Caro has had nothing but praise for her first installment in the series, Just A Girl, so of course I couldn't wait to read this one. You don't need to read the first book, as I haven't either and was still able to enjoy this one. It's wonderfully written. Hopefully you can pick up a copy soon and it'll be released overseas. Not sure if I'm slow and have only just noticed, or its new, but your blog has changed slightly! I LOVE IT. Anyway, onto the actual book, this looks interesting. So admittedly I'm not the hugest fan of historical fiction though, so I can see myself giving this a miss. It's new and it's changed, thanks to the lovely Mango Blogs. She's incredible! Me either Kara, but I love girl power and a woman who held control of a country, her crown threatened and scandal that embroiled her family. It was too delicious not to read. I really enjoyed it, and going to read book one shortly too, curious to what her life was like before she held her title. Thanks Eugenia, I absolutely love it too. My thoughts exactly. I was so vividly described, that she really came to life through the pages. I was fascinated by the fictional glimpse into her feelings about her reign and the controversy, especially that followed Mary. I rarely read Historical books but there have been some that interest me, depending on what historical figure they focus on. The Virgin Queen is one of them and I'm very intrigued to see how this book would handle her story and whatever changes they make. Plus, it would be an interesting study too how that era looked and treated their women, esp. royal women. Amazing review, Kelly! AND I LOVE YOUR NEW DESIGN. So pretty! Historically, it's all in there, but with a fictional take on what she might have been thinking and feeling at the time. It's incredibly vivid and a great take on her reign. Me too Michelle, but so glad I picked this up and gave it a try. I loved the politics and seeing the power struggle between the Queen and the men that served under her. I grew up reading historical fiction and you know how much I read now? NADA. (Okay, I lie. I totally read The Help this year.) So this intrigues me. But I think Mime read Just a Girl and wasn't fussed? But PFFT. What do little sisters know? I'M GAME FOR THIS ONE. I haven't actually read Just A Girl, but going to buy a copy to see how the two compare. This was lovely though, it took a while to get into, but once the scandals and gossip of Mary was introduced, and the love affair with her Horseman that Elizabeth couldn't act on, I was hooked. She was brought to life beautifully, definitely give this one a try and yes, don't listen to that sister of yours. Oh this one looks good. I'm not a historical fiction reader but sometimes j read the synopsis for some historical fiction books and just go "Yup, that sounds amazing. I need it" haha, and this one is one of those books for me. Lovely review Kelly! Thanks Lily. It was a really entertaining read. So vivid, like a fly on the wall account of one of most powerful women in history. I can't wait to see what you think of it. Hey I like the new layout. So gorgeous! Always wanted a spread like this... maybe one-day :D I love the idea of this book. I'm such a fan of historical fiction about real life historical people, but I'm not so sure this one would do it for me. pPerhaps one day I'll be less of a scardy pants and give it a try! Thanks Sarah, Mango Blogs is a fabulous coder. Really happy with the result. Nothing to be scared of, it's not gruesome, more scandalous and dramatic. A really fascinating read. Give it a try, it's incredibly entertaining. She won't be everyone's cup of tea, but I found it was a great balance between her life and those around her. I especially loved the Queen of Scots and would love to see her own story. Give it a try Aimee, it might really surprise you. I just recently finished reading a historical narrative (fiction) and it too seemed to take a while to flesh itself out. It took a lot of fortitude to finish it to say the least. Thanks Claudia. I'm not too sure about my banner just yet. I think it needs a little more oomph. Whatever that may be. I hear you. I've tried historical in the past, and not all of them have worked for me. Some have been just downright boring and stuffy. I think that's why I avoided the genre for so long. But Just A Queen could almost have been lifted from any fantasy novel really, where the reign and scandal of the court and delved into, without the magical elements. I actually really enjoyed it and looking forward to reading the original now, Just a Girl. Oh it's a series!? Hmmm. . .you can't deny how gorgeous the cover art is though; gah! Thanks Zoe and looking forward to seeing what you think of it it. I'm hoping we see more in the series, especially one about the Queen of Scots. Even though we already know what awaits her, she was so deeply embroiled in scandal and rumour, it would make for an incredibly entertaining read. YES! Me too Renee. I knew of the woman, but not her history and that of those around her. It's based on a historical recount, from Googling, it pretty true to life. But with her thoughts and interactions being fictional. But the entire premise was so incredibly vivid. If you love historical realistic fiction, you'll really enjoy this one. I don't usually, it takes a real interest for me to read them. But who can resist a woman in power, especially in a male dominated world. While it took quite a few chapters for me to get into it, I really enjoyed it. I haven't seen Reign, I haven't heard of it at all actually, so will have to check it out. This one has a lovely cover, very typical of historical romance novels though, I was quite surprised to read it was YA! It sounds interesting, I've not read the two as one before (if that makes sense, YA and historical). I think I shall stick this one on my maybe list :) Great review Kelly! It's beautiful Wattle, and I love the little gold accents and text. I think it's more crossover, with the original book being young adult in told in the time before she had become Queen, where Just A Queen is told from an aging Queen's perspective and looks back at her time so far in power. But it'll appeal to a far wider audience. Add it Wattle, if you enjoy the occasional historical read, you'll really enjoy this one. I'm not the biggest fan of historical fiction, I prefer the more fantasy or futuristic side of things, but this one sounds enjoyable. Elizabeth sounds like she could be a bit annoying though, but it's definitely interesting as she looks back at herself. Strangely reflective! Lovely review. She wasn't the tyrant I'd imaged actually, I expected her to shouting OFF WITH HER HEAD. Clearly I've read Alice in Wonderland far too many times. But it was absolutely fascinating to have that fictional glimpse into one of the worlds most powerful women. You're welcome Benish. It does have a little romance woven through, but it's forbidden and Elizabeth can't act on it for the fear of retribution. It's so true to the era though, right down to the dialogue between characters and their inner thoughts. I kind of really like the sound of this one, Kelly! Me either, but I'm fascinated by Elizabeth's story and her reign amongst so much controversy with her family, especially her cousin in the Queen of Scots. So true to the era as well. The cover is divine and has gold accents on it too.